Hikaru Nakamura beat Romain Edouard to make the playoff and then overcame Yu Yangyi and David Anton to win the Gibraltar Masters title for an incredible third year in succession. 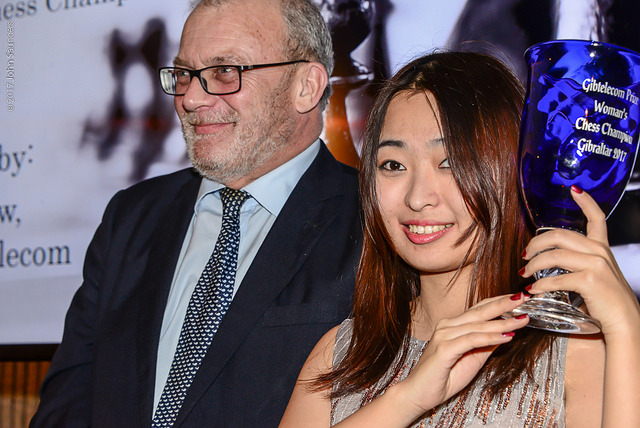 Even a defeat couldn’t stop Ju Wenjun claiming the women’s top prize, while Hou Yifan provided the other story of the day. The Women’s World Champion appeared after 25 minutes, opened 1.g4 and resigned in five moves in a dramatic but barely comprehensible protest over the number of games she’d played against female opposition. 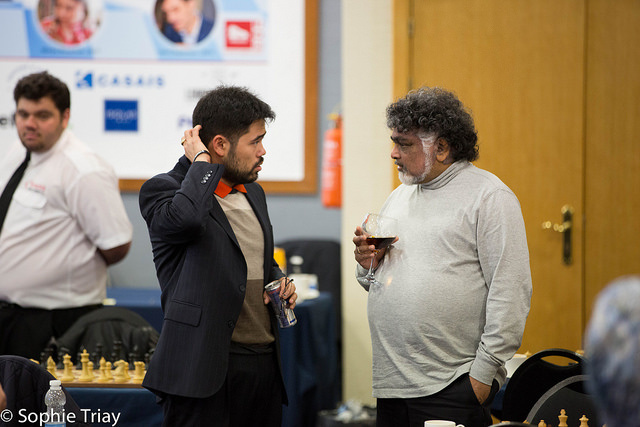 The last round of the Tradewise Gibraltar Masters started a full four hours earlier than usual, but just as chess fans and players were slowly waking up we were given a jolt by a bizarre piece of chess theatre. Women’s World Champion Hou Yifan turned up 25 minutes late to her game against Lalith Babu and played the move 1.g4. Initially her opponent assumed Hou Yifan wanted to get him out of his home preparation, so he spent over four minutes on 1…d5 – as it would later turn out, that could almost be classed as a blunder, since 1…e5! would probably have led to the shortest possible game of chess: 1.g4 e5 2.f3 Qh4# In any case 2.f3 was played in the game, and now Lalith knew something was up. There followed 2…e5 3.d3 Qh4+ 4.Kd2 h5 5.h3 hxg4 and Hou Yifan resigned. 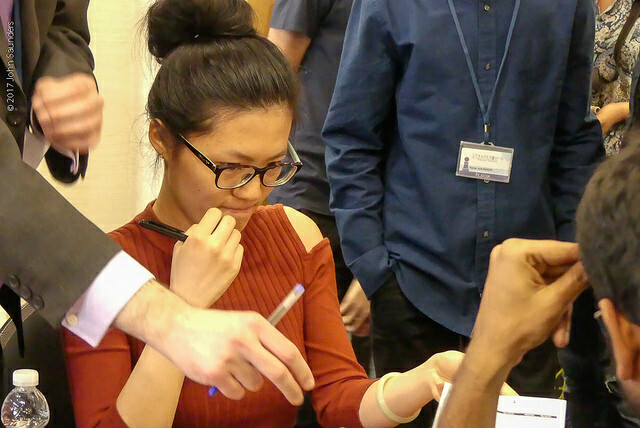 In a video that came after long and painful negotiations with the organisers, Hou Yifan offered a partial apology, “that I created such a game”, but still wouldn’t back down on what she described as “unbelievable and weird pairings”, adding that “for the future there should be a 100% fair solution”. Tradewise Gibraltar Masters Founder Brian Callaghan responds in the same video, noting that being the Women’s World Champion brings responsibility and that “she let herself down a little today”. He does offer an olive branch, though, stating, “I will look forward to having her back in Gibraltar again”. The deliberate loss of a game in any sport can have serious consequences, but in this case, with betting, for instance, almost certainly not involved, the damage is very limited. Lalith Babu joined the 14-player tie for 10th place, which may have had a small impact on other players. 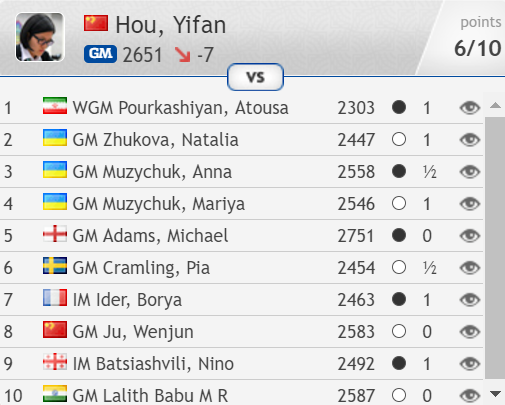 As Brian notes, though, the greatest harm was done to Hou Yifan. If she had won the game – and she outrated her male opponent by 64 points and had the white pieces – she would have taken the women’s second prize of £10,000. The incident spiced up the final round, but now it’s time to get to the real chess action. The one way we could have avoided a playoff in the final round is if David Anton had beaten Mickey Adams with the white pieces, but although Anton showed ambition by rejecting what seemed like an earlier offer to repeat moves, he decided to take a draw on move 32. That ended Adams’ chances, but meant any of the other seven players on 7/9 could make the playoff with a win. 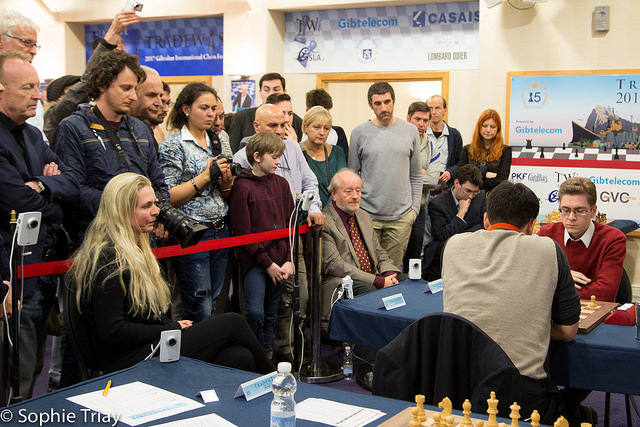 There were draws in Gelfand-MVL and Matlakov-Cheparinov, but wins in two of the other crucial games. 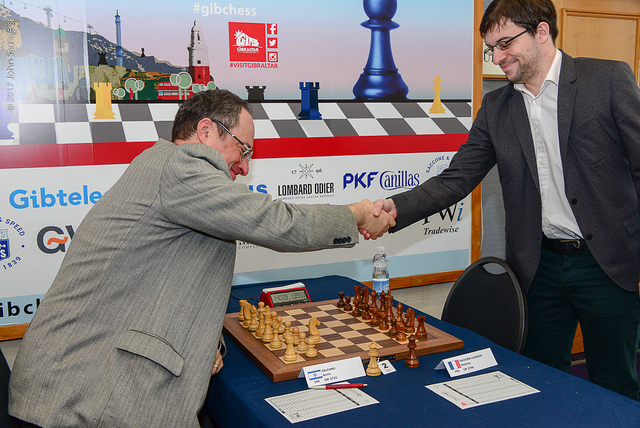 Romain limped on to move 35, but he couldn’t stop Hikaru getting another win on demand in the final round of the Gibraltar Masters. Conspiracy theorists might note that it was in the interests of China that Yu Yangyi won this game, since Ju Wenjun had already sealed the £15,000 women’s first prize, but of course with the white pieces and a 155-point rating advantage Yu Yangyi's win was hardly a surprise. 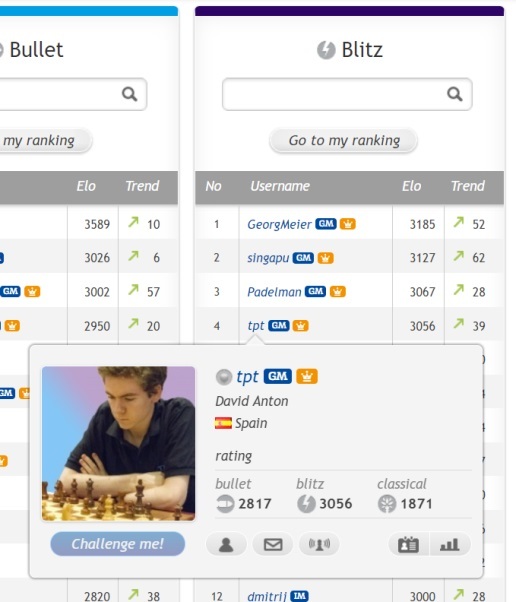 As you can see, David Anton topped the field in terms of his performance, with Nakamura later generously admitting, “Anton played the best tournament by far”. Hikaru singled out the Spanish grandmaster’s flawless conversion of a rook ending against none other than Boris Gelfand. 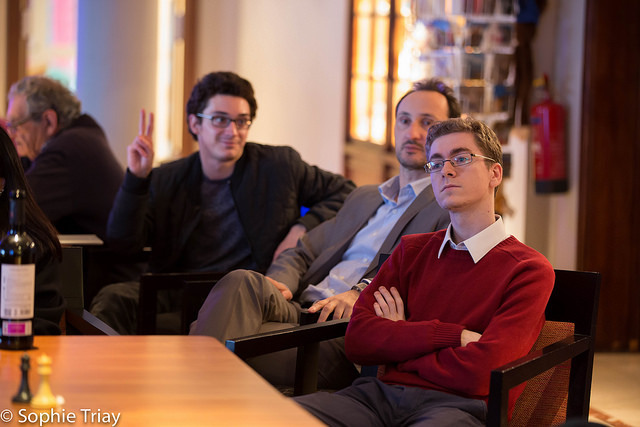 In terms of the tiebreaks the benefit of having the best performance of the three players was that Anton was able to sit and watch while Nakamura and Yu Yangyi battled it out for the right to play him in the final. Nakamura’s experience was in full evidence, since he was almost always in control. Yu Yangyi had White in the first game, but couldn’t prevent a 21-move draw. The second was one-way traffic, but Yu Yangyi defended tenaciously a pawn down to force blitz. Again it was Nakamura pressing and Yu Yangyi defending for his life, but with only seconds on his clock the Chinese player blundered away a crucial pawn and the game. Yu Yangyi needed to win on demand to take the match to Armageddon, but Nakamura swapped off queens early and held comfortably, with Yu Yangyi finally forced to overpress and lose. It seemed Anton might slowly but surely be able to bring over his king and gobble up the isolated c5-pawn. Instead the advantage fizzled away to a draw. 39.Qf1! was the final turn of the screw from Nakamura, with the threat of 40.Rh3 impossible to parry. David soon ended up playing a piece down, but resignation came on move 55. Now I’m a bit angry with this loss, but of course in general it was a fantastic tournament for me. 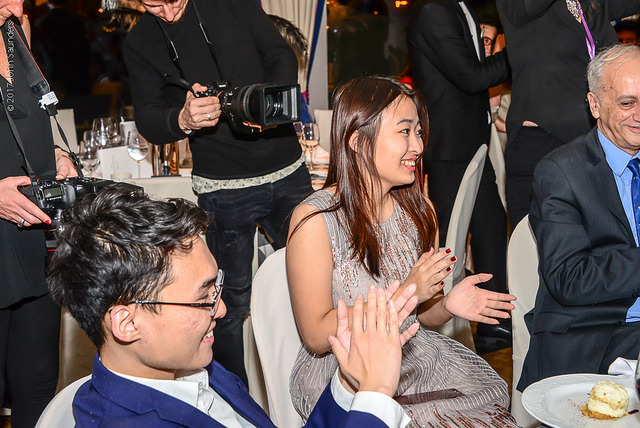 What remained, of course, was the traditional prize-giving dinner as well as plenty more chess! Thank you for following the event here on chess24! 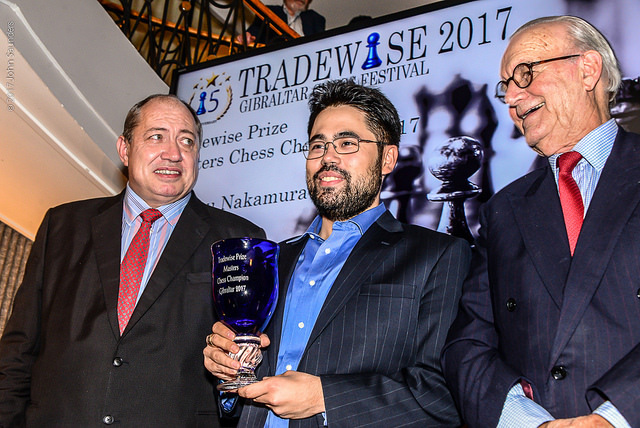 The good news is that the 16th Tradewise Gibraltar Chess Festival is already confirmed for Monday 22 January – Thursday 1 February 2018, with Vladimir Kramnik a likely participant.